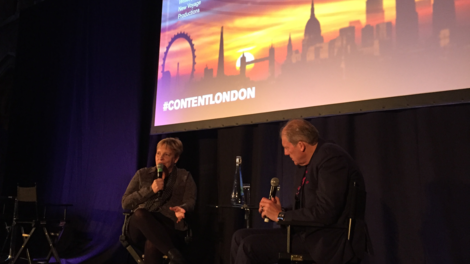 Film London supported C21's International Drama Summit at Content London last week. Bringing together over 200 speakers across more than 50 sessions, Content London's line-up was designed to ensure delegates stay on top of trends that shape the business. As part of the programme, Adrian Wootton, Chief Executive of Film London and the British Film Commission, held a one-on-one interview with writer and producer Karen Hall. Karen shared her journey as a writer in the industry; how she became the first and only female writer for M*A*S*H, one of the most successful US TV shows of all time, before writing and producing a huge catalogue of shows including Hill Street Blues and The Good Wife. Speaking on working in the industry now, Karen praised how far the industry has come from when "there were just three networks and TV was telling stories around the campfire" , to the fast-paced, inclusive industry it has become today. Adrian Wootton OBE was also in conversation with respected TV Producer, Kathy Ciric. Having recently produced high-end TV drama The Romanoffs for Amazon, Kathy discussed the decision to "be brave and move away from building sets", and instead shoot all eight episodes on location in eight different cities. This unique challenge encouraged a new way of working; using local production crews on each episode and filming with a different cast each time. Speaking of her time in London, Kathy was able to use the generous tax reliefs and praised Film London for their help providing a range of production support and securing multiple locations across the capital. To find out more about Content London, click here. To find out more about Filming in London, click here.